It was very convenient for staying over for an early a.m. flight, with restaurants both at the hotel and in the airport as well as gift shops. The security entrance was a few steps from the elevator. Very helpful. Airport parking was discounted, although difficult to find a place during the holiday week. Liked the outside veranda to get fresh air. Only 2 elevators functioning for guest use and creating delays. Perfect for the business traveler (or family) with an early morning flight out of Orlando. The rooms are wonderfully furnished, the staff is friendly and accommodating, and the price was excellent. I don't think I can...it was perfect. 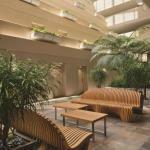 The Hyatt Regency Orlando Airport is beautiful. The people were friendly and the room was well laid out. I will go there again. What was not to like. Trying to find the parking area. This is an award winning luxury hotel with 445 large rooms and suites right inside Orlando International Airport. There are many special touches if you stay at this Hyatt Regency  all rooms have French doors that open onto balconies so you can watch the airport terminal from above. There is an indoor courtyard where you can view the stars under skylights. On the third level there is a shopping arcade and on the rooftop a heated swimming pool. All the accommodation is soundproofed from the airport noise and room features include: Stereo with an iPod dock, refrigerator, Internet access (additional charge) marble bath with Moen fixtures, multiple phones, satellite TV, iron and ironing board and coffee maker. All guests receive a daily newspaper and room service is available around the clock. The hotel being located in the airport terminal has obvious benefits and the hotel will arrange for luggage to be delivered from baggage claim to your room. Services offered by the hotels business center, open from 7am to 10pm on weekdays, include: package shipping, faxes and copies, private office with a computer, equipment rental and secretarial services. Two good places to dine: McCoy's Bar and Grill and Hemisphere steak and seafood restaurant. There is well-equipped fitness center and the front desk has all the information on Central Florida attractions. Parking: Yes, there is parking. Hotel guests must charge airport parking to their room for discounted prices which are $16 a day for valet parking and $12 for short or long term parking. Normal rates are $21 and $17.